I visited Slip House a few weeks ago, as part of the Great British Building series run by the RIBA. The architect and owner Carl Turner treated a group of architects and prospective self-builders to a guided tour of his unique and award winning home. The tour was preceded by a short talk, during which Carl described the thorny process of building your own home and studio. From the outset his house was designed to meet the highest levels of sustainability. Even the piled foundation harvests energy for the house, with an integrated ground source heat pump. The house is insulated to Passivhaus standards, and has no central heating system, instead relying on roof-mounted PV cells, the heat pump and a mechanical ventilation system aided by heat recovery. Built on one of four vacant plots, the gap where the house now lies was described by Turner as the ‘missing tooth’ in the terraced street. Designing a building that will initially be viewed in the round but must later become part of a terrace is certainly an interesting challenge. 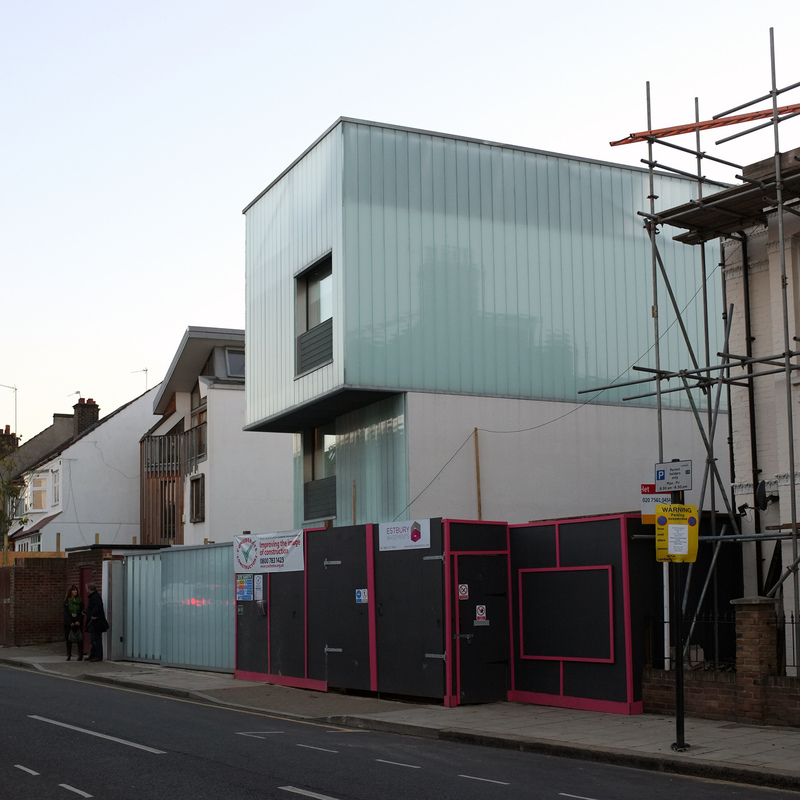 One immediate neighbour has already started construction of their house – also design by Carl Turner architects – I’m curious to see how Slip house will adapt. As an architect working within London’s often-draconian planning system, it is extremely impressive that he managed to convince the local planners that such a modern and dense typology was appropriate on a vacant brown-field site, surrounded by Victorian terraces. Our visit was perfectly timed, as we got to experience the house in daylight and experience its transformation as darkness set in. During daylights hours, the glass u-channel cladding is highly reflective, lending the stepped form a massive effect. From another angle this massive effect is diminished as the reflection in the glass surface catches the colour of the sky. 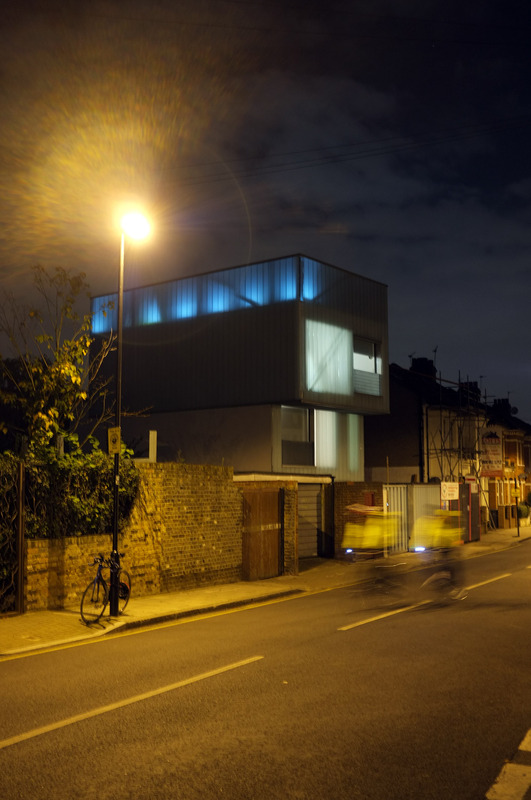 When we left the house, just after dusk, the street frontage was transformed by the activity within giving the glassy shell depth and animation and revealing the fully glazed spaces inside. Slip House is designed as a live-work unit, with Turner’s office housed on the ground floor. 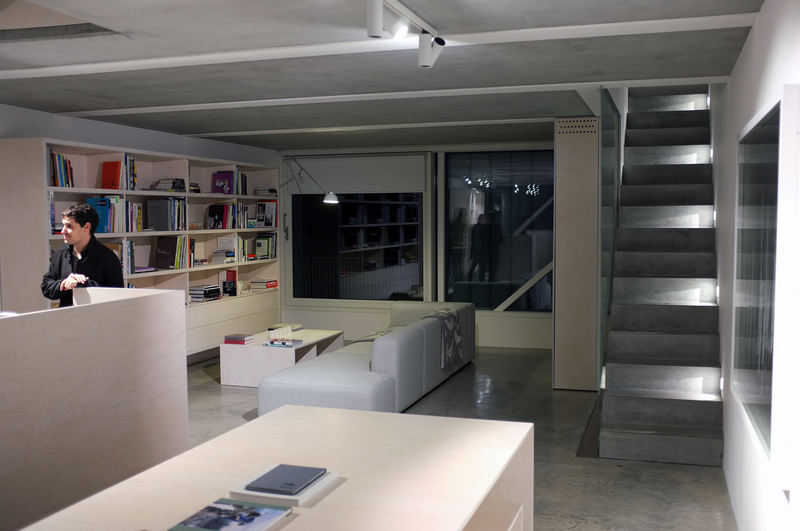 A narrow concrete stair, set is a dramatic triple-height void, leads you from the entrance level to the living area above, past the first floor with its two bedrooms and shared bathroom. The bright second floor open-plan living space is double aspect, and completely glazed at each end. A further flight of concrete stairs eventually leads to a generous roof terrace. The glass cladding forms a high balustrade, but does not obstruct amazing views across London. This layout offers great flexibility, with the potential to convert the workspace into a ground floor flat in the future. 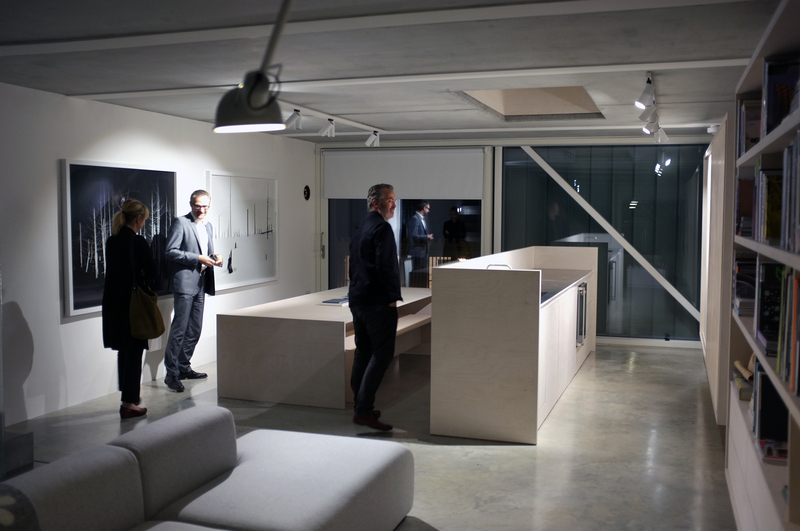 The interior is remarkably stark, but it is certainly not minimalist (As the architect was very keen to remind us!). There is texture and a surprising softness to be found within the limited palette. The matt exposed concrete soffits provide chalky monotone ceilings, contrasting beautifully with the mottled patina of the highly polished, power-floated concrete floors. The pinky beige tones of the birch-faced plywood joinery have been muted with several layers of white stain. Far from hiding the natural quality of the wood, the treatment has given the plywood surfaces a relaxed sophistication, not normally associated with this relatively cheap material. Another example of the thoughtful use of basic materials is the safety glass screen to the last flight of stairs. 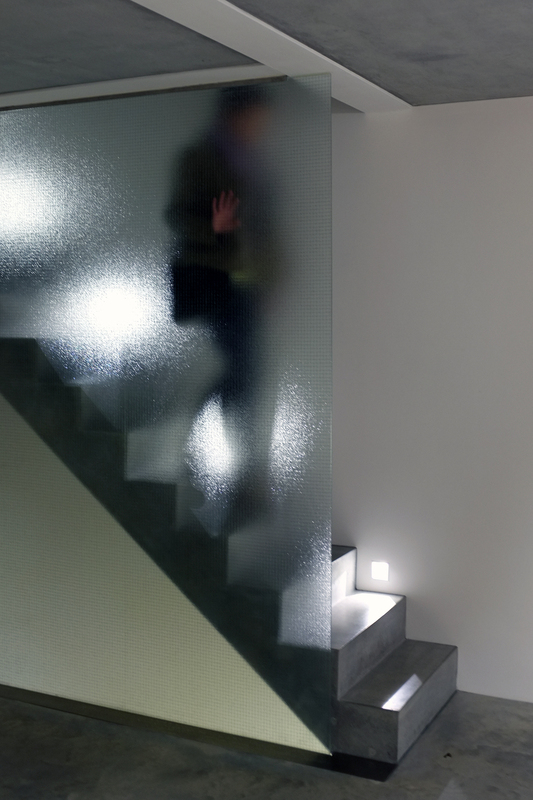 Normally considered the ugly, practical choice for an escape stair – here, as a frameless, undivided element it feels fragile and crisp. During his short presentation, Carl mentioned the debate between him and his wife, ‘the client’, over the use of colour on the walls. In the end the walls were painted white throughout. For me this is a missed opportunity, and I feel that some more colourful or darker finishes or furnishings would help to bring additional warmth to the smaller spaces, especially the bedrooms. That said, wall colour can be very easily changed, and it’s not my house!